FabricMate Dye Ink Markers lend a fresh new look to fabrics, making them ideal for clothing, decorations, and craft projects of all kinds. 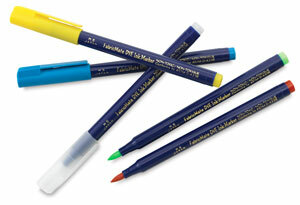 Pigment-based fabric dye in a pen form, FabricMate Dye Ink Markers are easier to use than brushes and paints. The sturdy chisel tips on these pens are set low in the barrel and won't wobble or bend. They’re ideal for dying techniques where a broad stroke is required, yet feature two sharp edges that can be used to make fine lines. ® Yasutomo is a registered trademark.